The “Conca Tre Pile” is a hilly area in Bussia Soprana whose main vines are Barbera’s with vineyards having a maximum age of 45 years. 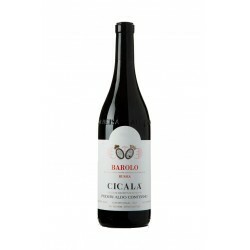 The vineyard “Cicala” is about 40-45 years old and the vines are replanted from time to time. The main variety of Nebbiolo is Lampia and its rootstock is Rupestris du Lot. The "Poderi Aldo Conterno" winery is situated in Bussia of Monforte d'Alba which is the heart of the Barolowine area. The estate, which vinifies exclusively its own grapes, consists of 25 hectares of vineyard. Most of the soil, which is at an altitude of 350 - 400 m. above the sea level, is located South / South - West and is composed of clayey marls and limestone with layers of sand. The yields per hectare are very low and the total production is about 80.000 bottles a year. The harvest begins in mid September and done exclusively by hand with a very careful selection of the picked grapes. Always following a strict family tradition, red wines are neither clarified nor filtered.